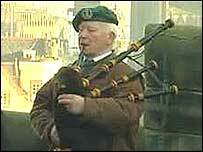 A piper who played the bagpipes as the troops went ashore during the D-Day Landings has been honoured in song. Scot Bill Millin, who is now 82, has lived in Dawlish, Devon, for 40 years. Inspired by his musical past, north Devon folk singer Sheelagh Allen has written a tune for him called The Highland Piper. Mr Millin was nicknamed the Mad Piper for going ashore piping the Highland Laddie under the instruction of the eccentric Lord Lovat. 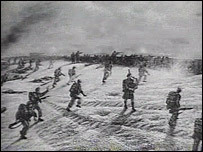 When the offensive was launched, Scottish servicemen were among the first to land on Sword Beach at Normandy. Lord Lovat led his commandos ashore to the skirl of the bagpipes and asked piper Millin, then aged 21, to play to rally the troops' morale. Mr Millin, whose actions have already inspired books and paintings, said he was "very honoured" to now be celebrated in Ms Allen's song. "Unfortunately I can't play the bagpipes for her in return," he said.